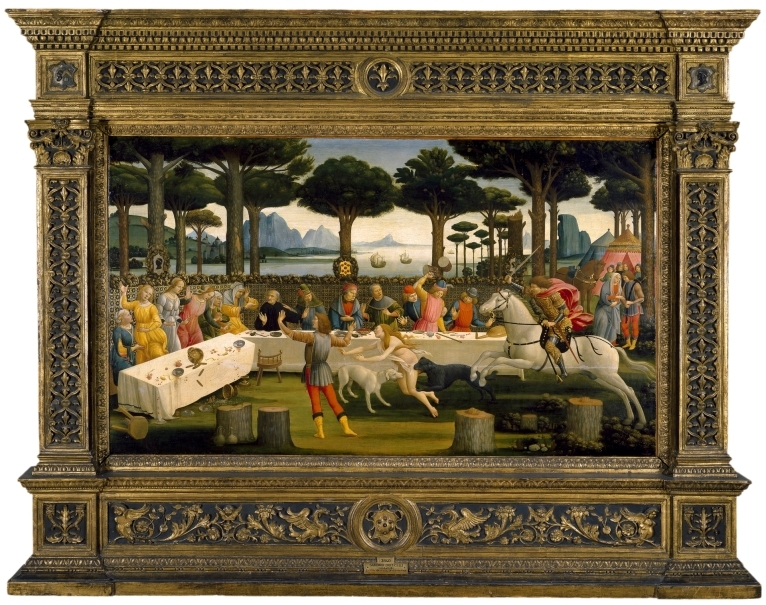 These panels (P02838, P02839, P02840), along with a fourth one in a private collection, illustrate the Story of Nastagio degli Onesti, the eighth novel of the fifth day of Boccaccio´s Decameron. This is the story of Nastagio, a young man from Ravenna who was rejected by the daughter of Paolo Traversari and abandoned the city to settle on its outskirts. The third panel shows the guests´ reaction to the events, and how Nastagio´s beloved uses a maid to indicate that she is willing to marry him. The fourth panel depicts the wedding banquet. These paintings were commissioned in 1483 by Antonio Pucci for the marriage of his son, Giannozzo, with Lucrezia Bini. The coats of arms of both families flank those of the Medici on the third panel. 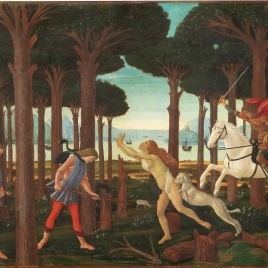 Specialists see Botticelli´s hand in the overall design and in certain figures. They also detect the participation of his assistants, Bartolomeo di Giovanni and Jacopo del Sellaio. Height: 83.5 cm. ; Width: 142.5 cm. Reinach, Salomon, Repertoire de Peintures du Moyen Age et de la Renaissance. 1, Ernest Leroux, 1905, pp. 734. Venturi, Adolfo, Storia dell' arte italiana, U. Hoepli, Milan, 1911, pp. 592. Marle, Raymond Van, The development of the Italian schools of painting, Martinus Nijhoff, La Haya, 1931, pp. 216. Tormo, Elias, Estudio de los Botticellis en España, Boletín de la Sociedad Española de Excursiones, 46, 1942, pp. 1. Sánchez Cantón, Francisco Javier (1891-1971)), La colección Cambó /, Alpha, Barcelona, 1955, pp. 44. Berenson, Bernard1865-1959, Italian pictures of the Renaissance: list of the principal a, Phaidon, Londres, 1963, pp. 36. Francastel, Pierre, La Realite Figurative, Elements Structurales de Sociologie d, Denoel Gontjier, Paris, 1965, pp. lám.27. 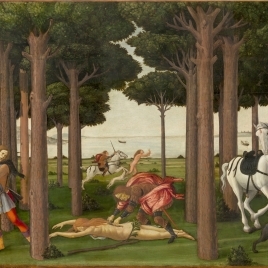 Bo, Carlo, La obra pictórica completa de Botticelli, Noguer, Barcelona.Madrid, 1970, pp. 36. 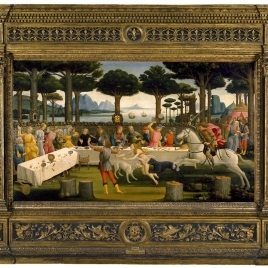 Museo Nacional del Prado, Museo del Prado: pintura italiana anterior a 1600, Gredos, Madrid, 1979, pp. 454. Museo Nacional del Prado, Museo del Prado: catálogo de las pinturas, Museo del Prado, Madrid, 1985, pp. 77. Brown, Jonathan1939-, Art and History. Images and Their Meaning, Cambridge University Press, Cambridge, Nueva York, 1988, pp. 14/ lám.1. Moulin, Leo, Les Liturgies de la Table. Une Histoire Culturelle du Manger, Fonds Mercator, Anvers, 1989, pp. 404,405. Colección Cambó, Ministerio de Cultura, Madrid, 1990, pp. 211. Scott, Barbara, Letter from Paris. The Musée des Tissus in Lyons, 134, 1991, pp. 280-282. Museo Nacional del Prado, Museo del Prado. Inventario general de pinturas. Nuevas Adquisiciones. Museo Iconográfico. Tapices., Museo del Prado, Espasa Calpe, Madrid, 1996, pp. nº1722. Museo Nacional del Prado, Pintura italiana del Renacimiento: guía, Museo del Prado, Madrid, 1999, pp. 41. Rubin, Patricia Lee, Renaissance Florence : the art of the 1470s, National Gallery, 1999, pp. 138-139 / nº7. 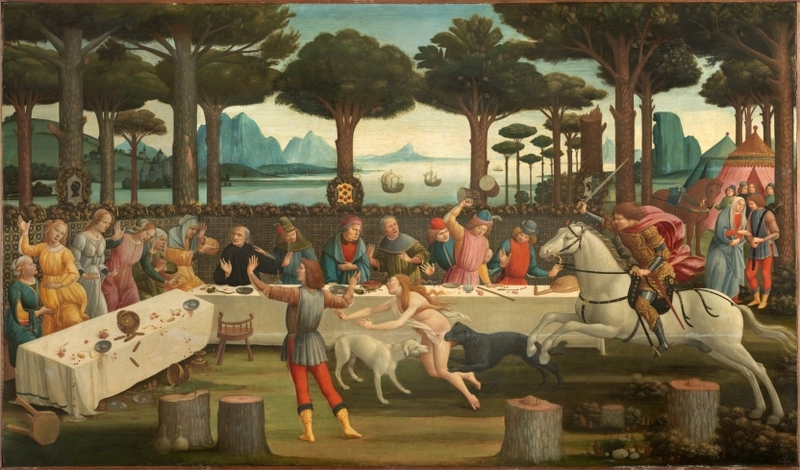 Cast, D, Boccaccio, Botticelli y la Hª de Nastagio degli Onesti. En Historias inmortales, Barcelona, 2003, pp. 71-85. Bendiner, Kenneth, Food in Painting : From the Renaissance To the Present, Reaktion Books, London, 2004, pp. 162. Museo Nacional del Prado, El trazo oculto: dibujos subyacentes en pinturas de los siglos XV y XVI, Museo Nacional del Prado, Madrid, 2006, pp. 138-147, nº 7. Botticelli : likeness, myth, devotion :, Hatje/Cantz, 2009, pp. 36 / 23. Bayer,A, El amor y el arte en la Italia del Renacimiento, Numen, nº 7, 2009, pp. 28-33. Garrard, Mary D., Brunelleschi' s egg : nature, art, and gender in Renaissance..., University of California Press, 2010, pp. 98. Blanco, Miguel Angel, Historias naturales: un proyecto de Miguel Ángel Blanco, Museo Nacional del Prado, Madrid, 2013, pp. 52-55 119. Catalucci, Valentina, La Famiglia del Nero di Firenze. Propietà, patrimonio e collezioni. 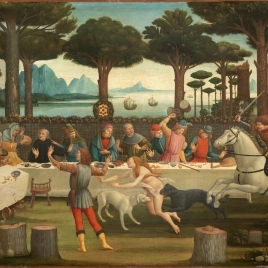 Il palazzo Del Nero., Studi di Storia dell'Arte, 24, 2013, pp. 147-180 [161-162]. Inv. Nuevas Adquisiciones (iniciado en 1856). Núm. 1722. Catálogo Museo del Prado, 1942-1996. Núm. 2840.